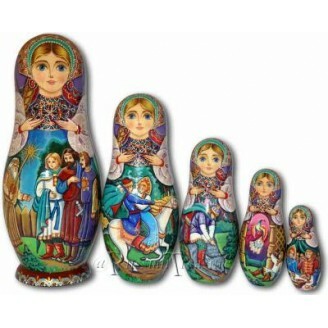 This set of Matrioshka Dolls gives you a great opportunity to deep into the magical world of fairy-tales. The story of Ivan Tsarevich, the Firebird and the Grey Wolf, featured on these Matrioshka Dolls takes pride of place among Russian fairy-tales. The world-famous Russian artist did his best to reflect the plot of this magical story on these set of Matrioshka Dolls. All the Matrioshka Dolls complement each other so you could get the complete idea of the story. These Matrioshka Dolls were designed and hand-painted, and personally selected from the artists that we have worked with for many years, so you can be sure that you won’t find items alike, because our Matrioshka Dolls are unique ones. The first Matrioshka Doll features the Tsar asking his three sons to catch the Firebird and bring it to him, next three Matrioshka Dolls tell us how Ivan, assisted by a Grey Wolf who killed his horse and then felt sorry for him, managed to get not only the Firebird but also a white horse and a Elena the Fair. The last Matrioshka Doll reveals a happy end of the story – marriage of Ivan and Elena the Fair. On the upper part of the Matrioshka Dolls Elena the Fair is depicted. She is dressed in majestic clothing of Russian princess (marvelous jewels, kokoshnick decorated with gems, fabulous kerchief); her face is drawn very delicate and deep, especially her eyes. Mixture of soft, creamy and rich colors of Matrioshka Dolls adds a dreamy quality to Matrioshka Dolls set. Catch these beauties - Matrioshka Dolls - while they last! They can be a good Valentines’ gift for the person you like or love. If you want express your feelings in unordinary manner – this is a really good opportunity for you.